Earlier this year, I shared a reading list for servant leaders – all my favorite books for those interested in deepening their understanding and practice of servant leadership. In this list, I want to focus on books to help you develop three of the most essential skills for servant leaders: listening, empathy, and stewardship. Why did I pick these three skills? Well, in one of my last posts, I reviewed a list of traits identified by president and CEO of the Larry C. Spears Center for Servant Leadership that describe the key characteristics of a servant leader. There’s 10. But listening, empathy, and stewardship stick out to me. These resonate because I haven’t always been the best listener myself (as my wife reminds me). Without empathy, it’s impossible to serve others from the heart (instead of just going through the motions in service of self), and practicing stewardship at Berrett-Koehler helps me honor the voices of all stakeholders and lead by persuasion instead of title. For each servant leadership characteristic, I’m recommending two books that have helped me in my own servant leadership practice. May the combined wisdom of these six books help you transform your workplace and beyond. I may be a little biased, but I think when we look back twenty years from now, Servant Leadership in Action will go down in history as a classic. This book has been in the works for more than two years at Berrett-Koehler. For Ken Blanchard, it’s probably been in the works for an entire lifetime. And it couldn’t arrive at a better time. As I noted in my post at the beginning of this year, there’s a hunger for change in the way we lead. Leadership is outgrowing the old models, and the business world is awakening to this. 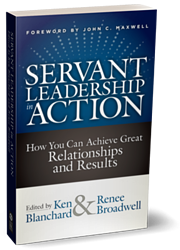 Servant Leadership in Action captures this shift perfectly, and brings together 45 voices in leadership to offer critical skills and perspective to incorporate into your own practice. The Big Idea of Servant Leadership in Action is that you can optimize both relationships with people and measurable performance results using this leadership model. The prevalent command-and-control leadership model gets results, but does so at the expense of people, leading to toxic work cultures and high turnover. Leadership models emphasizing only relationships may hamper results. The Servant Leadership model, when practiced correctly and consistently, achieves both. What distinguishes Servant Leadership in Action from so many other books on the subject is that it is full of specific practices that readers can take into their everyday work and personal lives—hence the last two words of the title: “in Action.” It also includes a combination of depth and breadth not seen by other servant leadership books, because it offers insights from servant leaders who have proven this model works in their own companies, such as Colleen Barratt, former president of Southwest Airlines; Garry Ridge, CEO of WD-40 Company; Cheryl Bachelder, former CEO of Popeyes Louisiana Kitchen; and Ken and Margie Blanchard, cofounders of The Ken Blanchard Companies. Communication is essential in a healthy organization. But all too often when we interact with people—especially people who report to us—we simply tell them what we think they need to know. This shuts them down. The Big Idea is that leaders who listen do better than leaders who tell. 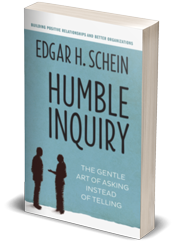 Humble Inquiry really helped me slow down and listen intently to what others were saying. It’s so easy as a leader to assume you know best, but without asking questions, you only know what you know. When you ask questions, you get smarter and convey a willingness to learn in the process. This can generate bold new ideas, avoid disastrous mistakes, and develop agility and flexibility in the organization. The amazing thing about this little book is that you don’t have to become humble overnight. Just practice asking instead of telling in your daily interactions, and see what happens. The Big Idea is that great companies need Level 5 leaders who can instill their values in the whole company. The heart of Level 5 leaders is humility, which is also the heart of servant leadership. 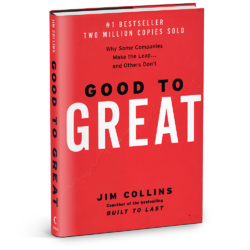 Jim Collins celebrates companies where the leadership team listens to their employees instead of tells them what to do, and listens to the customers instead of assuming that they know what the customers need. Collin’s rigorous analysis found that the most effective “Level 5” leaders are humble and strong-willed instead of outgoing with big egos, which flies in the face of conventional wisdom about leadership . Stepping back from the limelight to see what is best for the company and all its stakeholders instead of what is best for the C-Suite and board is not routinely taught in business schools. Level 5 leaders don’t need to take the credit for their companies’ success; they willingly give the credit to others. Humble Inquiry is the hand that goes into the Good to Great love. Without deep and selfless listening, you will never develop the commitment among your fellow employees that is necessary to produce great results year after year. The Big Idea is that when the leader trusts others, the organization is transformed. A lack of trust pervades many companies, and often this dearth of trust emanates from the top. 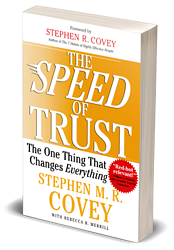 Covey argues that trust and “the speed at which it is established with clients, employees, and constituents—is the essential ingredient for any high–performance, successful organization.” Without trust throughout your organization, you are doomed to bureaucracy on mind-numbing checks and balances that zap the human spirit. Colleen Barrett took the reins from Herb Kelleher, founder of Southwest Airlines, and took the company to the next level. She did it based on the practice of servant leadership. 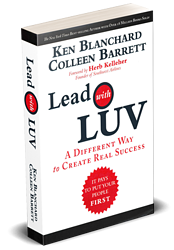 The Big Idea in this book is the power of love in leading companies to great results. Barrett and Blanchard show how making a positive difference in other people’s lives is the best way to make a difference in your own. They talk about how to catch people in the act of doing good and praise them on the spot for it. This encourages people to keep doing more of the same. I’m a loyal Southwest Airlines customer, and I can tell the Southwest staff are having fun and loving their jobs. It must be a breath of fresh air to them that the way to move up ranks is not to be more egotistical and selfish than their colleagues, but to be move loving and unselfish. If only all companies operated on the ethos of love that Southwest Airlines exudes, the world would be better place. Empathetic leaders who step outside of their own egos, put themselves in the shoes of their colleagues, and then shower them with love can build strong, trustful, and sustainable organizations that can weather many a storm. This seminal book influenced a generation of servant leaders over the last 25 years since its publication. Peter Block lays out a compelling and practical vision of the shift required to create the successful workplaces that are needed in today's world. He explains what is needed to create organizations where everyone is deeply committed and accountable for its success. 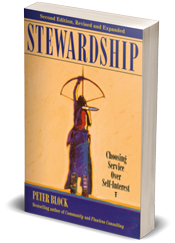 Stewardship is about how to create a culture of service. Stewardship begins with our own attitude - a willingness to be deeply accountable for a team, an organization, a community. It requires a willingness to let go of the need to control or take care of others. Most leadership models are based on the idea of being ‘good parents’ - helping subordinates grow, develop and accomplish their goals, rewarding their efforts and successes. It seems benevolent. However, it prevents people from becoming stewards of their organization. It is not possible to assume deep responsibility and accountability, and at the same time be dependent, expecting someone else to take care of you. Berrett-Koehler founder and president Steve Piersanti gave this book to me the day I was hired ten years ago, quietly saying that this book—more than any other we’ve published—represents the heart and soul of our company. I see now what he meant. I feel responsible and self-accountable for my work as never before. By Simon Sinek (2014, 368 pages) The Big Idea is that great leadership is built on empathy, trust, respect, and dignity. When leaders are humble, it gives permission for everyone in the company to be humble. However, when readers pit employees against each other, as Jack Welch did at GE, it creates a "survival of the fittest" culture with results that are not sustainable. 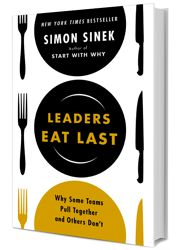 Instead of short-term, command-and-control management, Sinek advocates for long-term leadership as practiced by James Sinegal, CEO of Costco, who serves all employees so they can in turn serve the customers. Sinek uses brain chemicals—endorphin, dopamine, serotonin, and oxytocin—to describe why people respond better to trust and respect than fear and survival. Both Stewardship and Leaders Eat Last emphasize the power of openness and persuasion instead of control in serving others. When you have a genuine voice in the decision and are not being coerced by people up the corporate ladder, you will naturally feel more ownership and committed to the outcome. Between these seven recommendations and my earlier suggestions in A Reading List for Servant Leaders, now you have 17 books to help you practice servant leadership in your own work and personal lives. I hope you enjoy reading this new batch of gems as much as I do. Much appreciation to those of you who have written me with servant leadership books you are writing yourselves. We are a leading publisher of servant leadership books, and are always looking for new talent, so I invite you to review our Proposal Guidelines and send us your book when you are ready.